As a member of EatWithMe, I had no hesitation in signing for the sushi making demonstration when I heard that Akachochin was hosting it. The restaurant had opened since April 2012 and had maintained consistent food and service according to Urbanspoon members. South Wharf is still establishing itself to be in the high end dining and shopping scene. Other restaurants in the area include The Sharing House, Shed 5, Bohemian Bar and Restaurant just to name a few. Head Chef Kengo Hiromatsu (and I think owner as well) prepared one of Akachochin's signature dish - Hiramasa Namerou aka kingfish tartare served with rice cracker. The recipe was simplistic but very delicious. The rice cracker could take more than a day to make as it involves a drying out process for that sublime crunchy texture. The soy beans and picked wasabi stalk are other exotic ingredients to tie all the flavours together. I wanted more! Head Chef Kengo later shed some light into sushi making and the techniques involved. 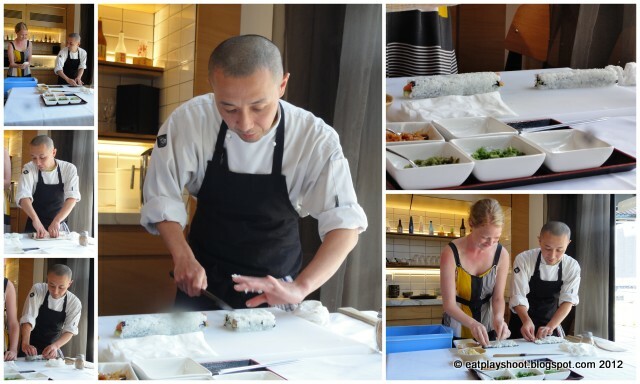 I have been to other sushi making classes before however it is always interesting to hear what other tips the chefs impart. He prepared an inside-out sushi with the help of a volunteer from our group. She was able to eat her salmon avocado creation afterwards. They served us snapper, tuna, salmon and vegetarian sushi rolls/nigiri. The fish was fresh and served traditionally warm (around human body temperature), not icy cold like Kengo said. The light dishes were accompanied by a beautifully smooth sake from the Mikata region. Sadly, I didn't get the name of the drink. Would I return to try their food again? Yes definitely! 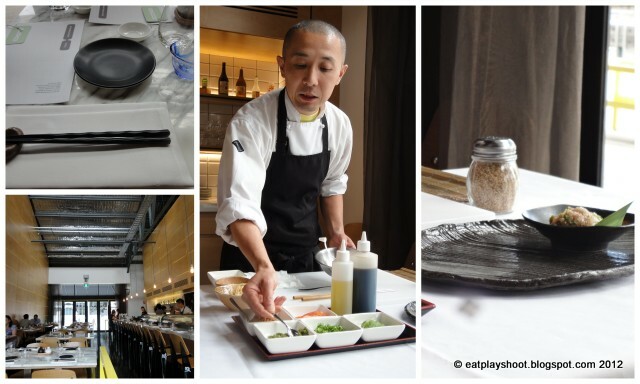 This event was exclusive to EatWithMe members and costed $35 for the sampling dishes including the sake. It was a fun way to meet new people and a nice way to share a meal with other food loving minded people. It may hosted again in the future - best to sign up with EatWithMe to be kept informed of all the happenings!